This easy to make hummus is an excellent all rounder, made with chickpeas which are full of protein and fibre. It is great as a dip with crackers and vegetable sticks, pizza topping, kids sandwiches and in burgers. A perfect addition to your Summer BBQ salads. 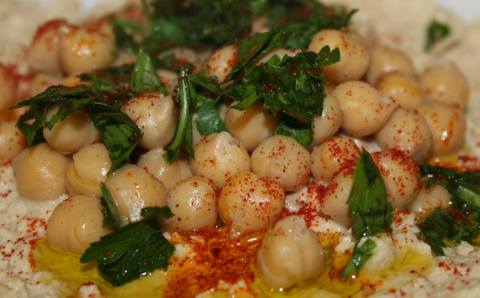 You can be creative and invent your own style hummus. In the picture here I have added chopped up sun dried tomatoes. 1x clove of garlic crushed or more depending on how much you and your whanau like garlic! Drain the chickpeas and keep the liquid in a cup. Add all the ingredients to a bowl or mixer. Mash with whatever you have handy, fork or potato masher will work well. Even better if you get the kids to help you out! Add a small amount of the chickpea liquid and mix. Keep doing this until the hummus is just a bit runnier than you like. It will thicken up over night. I like mine quite thick and don’t mind if there are chickpea chunks. Store in a airtight container in the fridge for up to a week. Here are some ideas to jazz it up a bit or you can check out the ingredients list on the fancy hummus in the supermarket and add them to yours!